Enbrighten Vintage Seasons Café Lights bring the newest outdoor lighting technology to your home. Incredibly energy efficient, these lights reduce energy use by over 95% while not diminishing lighting quality. The bulbs are made of acrylic, making them highly durable and impact resistant. Being of the LED variety, they come with a lifetime warranty, meaning you won’t need to worry about changing bulbs when they burn out. 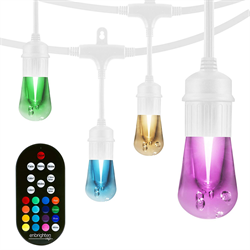 Using the remote, you can select up to 16 single different colours or up to 120 colour combinations. It also lets you set colour and effect modes such as fade and strobe options. You can set timers anywhere from 2 to 4 hours as well as dim the lights up to 10 different levels. The bulb’s rustic and vintage look makes it a great addition to patios and backyards as well as for indoor lighting for parties and basements. This 12 bulb/24 foot model can also be looked with others up to a combined length of 750 feet, which makes it great for large-scale lighting scenarios and reusable in the case of patio expansions. Comes with a white cord.